One tech integrator we’ve had our eye on for almost a year, has finally galvanised its OTT on-demand digital streaming strategy and is now fully prepped on parallel launch-pads in Brazil and Indonesia. And in a strong signal of the industry validation of its tech, has just signed up a top ex-Microsoft Executive to the board. With a range of commercialisation options on the table including Asia and South America, TV2U (ASX: TV2) has bagged a couple of early MoUs and signed agreements with significant telcos in Brazil and Indonesia to broadcast on-demand content to any device. Similarly to what one would expect to see on Netflix or Amazon Prime, TV2 is proposing to bring popular content to mobile phones, laptops and PCs — but with the added commercialisation zest of incredibly powerful analytics tools, coupled with a scalable business model, made possible by the Internet of Things (IoT) and the explosion in digital connectivity. 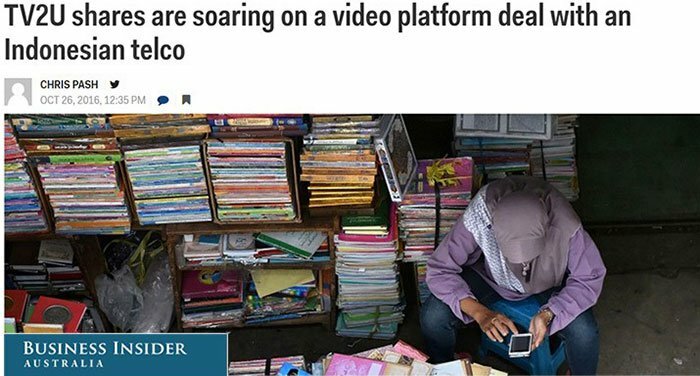 It’s not just Western digital content junkies that will be providing the commercial spend over the next decade — consumers in many developing countries in Latin America and Asia are also in the market. The great news for TV2 is that having turned into a tech-savvy digital content provider and having got the ball rolling with its IVAN-powered platform, this digi-tech sprite is now licking its lips at the potential first taste of revenues, likely to be forthcoming over the next few months, especially as a former top Microsoft executive has joined the fray to help push its commercial and technical interests along. Of course, it should be noted that TV2 is an early-stage tech play, so it carries a fair bit of risk compared with the blue chips. If considering this stock for your portfolio – seek professional financial advice. Traditional modes of viewing are being replaced by an online entertainment alternative that can be streamed to your phone, tablet or existing television. All at the convenience of the viewer, not the broadcaster. Services like Apple TV, Amazon Prime and Netflix have hit the nail on the head in their on-demand streaming business models, so why not take this one step further by repeating the trick in developing countries while offering additional customisation and analytics options to boot. TV2 is embracing the digital revolution with the utmost degree of connectivity and economics of scale in mind. We first wrote about TV2U International (ASX: TV2) in February 2016, when TV2 parachuted onto the ASX. We went through TV2’s alluring digital features in an article titled, ‘New ASX Listing Today: TV2U’s Next Generation Online Streaming Platform’ upon TV2’s first steps as a young digital buckaroo after listing on the ASX. Now, since its high, the share price has retreated somewhat. However given the number of agreements signed up over the past year, we would expect TV2 to start bearing fruit of the revenue variety very soon – all of which has the potential to influence the company’s share price in a positive way. The company recently completed a placement of 76,923,076 fully paid ordinary shares at 0.013 cents per share to raise over $1M, plus a one for four free attaching option on the same terms as the currently listed options to institutional, professional and sophisticated investors. TV2 is also undertaking a 1 for 10 non-renounceable rights issue to raise approximately $1.6M through an offer of up to a maximum 123,281,433 shares. Both offers will be issued at 0.013 cents which is a 25% discount to the 15 day volume weighted average price of shares. The money will go towards delivery of OTT services to customers, content rights, Karaoke 2U marketing research, working capital and expenses. appointment of former Microsoft executive Alan Boyd to the board . Mr. Boyd is seen as a pioneer of the US personal computer industry, and served as the first Product Development Manager at Microsoft, which he joined in 1980. Mr. Boyd has also advised the Chinese Government on technology and IP development. His knowledge and business network in China will be of importance in presenting TV2 technology to commercial opportunities within China. Mr Boyd is one of the world’s most experienced technology, media and intellectual property investment and development specialists with a long record of success in Europe, America, Australia and Asia. He brings to TV2 industry contacts, technical capabilities and commercial knowledge and will be assisting in driving the focus of the company’s OTT content service distribution and platform as a service (PAAS) commercial sales programs globally. His experience will also be invaluable given the red-hot debate raging on about digital privacy and security in China. Due to this, TV2 has made the prudent decision to divert its focus to a region with equal potential — Brazil. Brazil may have less people than China, but like China its middle class has grown substantially . It is a class which is deemed most commercially opportunistic for Tech companies looking for customers. TV2 is now poised to commercialise two prime regions for current and future consumption of digital content. Regions like Asia and Latin America remain as the next-best bastions of commercial potential and are currently the best regions to target if scouring the web for new OTT clientele. As seasoned tech investors all know, the first steps for any tech ‘start-up’ often require revenue generation to enable future growth and consolidation. TV2 has therefore earmarked a whole host of deals that have a reasonable chance of propelling this sector-hopper towards becoming an emerging-market leader in OTT services. However, commercial viability and market leadership is still quite some way along the track for TV2 and will take time to establish, investors interested in this stock should therefore maintain a cautious approach to their investment decision. Late last year, TV2 signed a dual-pronged deal with two Brazilian telcos in order to put its online digital platform on Brazilian ‘store shelves’ (of the online variety of course). TV2 signed a Memorandum of Understanding (MOU) with SOL Telecom (SOL) and Amazonia Publicidade Ltda (GTV) to be their prime provider of OTT content. These two deals are essentially the foundation for a disruptive and focused expansion into Latin America as a continent. Being the most commercially active country, Brazil represents the most opportune place to test TV2’s resolute business strategy in South America. TV2’s proprietary platform has undergone field trials as a proof of concept to ensure a quality service and that all technical details have been accounted for. Both, Sol Telecom and GTV have approved the proof of concept. Assuming everything goes smoothly, full-blown commercial agreements will be signed and TV2 will have its first taste of revenue in Latin America. Both SOL Telecom and GTV are now almost fully committed to making TV2 an integral part of the content line-ups they have assembled for millions of viewers. The important aspect to remember is that TV2 will effectively be upgrading the current antenna-only method of delivering streaming content (including TV) to viewers. Currently, Latin America provides a viewing experience similar to what Western countries had a decade ago — all content picked by channel directors and sent via the airwaves to people’s TV sets. However, over the next decade, many Latin American countries are intending to move up in the sophistication stakes by delivering a personalized viewing experience to multiple consumer devices including mobile devices, tablets, PCs and even smartwatches. All this is part of the ‘cord-cutter’ phenomenon currently being fuelled by millennials simply disgusted by the currently linear method of providing TV programming. Brazil has been a major target market for TV2 for some time as it has around 19.5 million Pay TV subscribers and is the biggest market in all Latin American countries. Pay TV has a very large growth potential given that Pay TV penetration is below 30%, and many telephony and internet providers are looking to expand their footprint in the coming years while complementing, or in some cases even replacing, the core Pay TV offerings with new OTT services. A recent industry report on OTT TV and video revenues in Latin America (for 18 countries) will reach $3.59 billion in 2021 which is more than triple the $1.15BN in 2015. SVOD (subscription video on demand) will remain the region’s largest OTT revenue source; contributing $2,093M by 2021 (or 58% of the total). The report estimates 31.87 million SVOD subscribers by 2021, up from only 12,000 in 2010 and 11.22 million at the end of 2015. OTT TV and video rental/pay‐per‐view revenues will still expand rapidly, climbing from $100 million in 2015 and to $295M in 2021. Advertising on OTT sites (AVOD) will bring in $727M by 2021 – up from $266M in 2015. For now, TV2 has signed a Heads of Agreement (HOA) with PT. PGAS Telekomunikasi Nusantara (PGAS) to deliver white labelled interactive OTT managed service in Indonesia — the world’s 4th most populous country currently measured at 250 million people. PGAS is Indonesia’s leading utility and telecommunications group with 1 million home customers and more than 100,000 businesses. In addition PGAS operates and manages 1,300 km of fibre optic with a network capacity of 160Gbps from Jakarta and Java, to Sumatra, Bali and Singapore. This services 70% of Indonesia’s Internet Service Providers. This provides access to a large potential customer base. This means there are approximately 100 ISPs using PGAS network, this being 50 million customers. In partnership with TV2, PGAS aims to convert this captive audience into subscribers. PGAS will pay US$3.5M and a monthly management fee per active subscriber to TV2 to cover the cost of expanding TV2’s platform and management of services into the region of Indonesia. PGAS is a subsidiary of the Indonesian government‐owned PT. Perusahaan Gas Negara (Persero) Tbk (PGN), the largest natural gas transportation and distribution company in Indonesia. PGN generated more than US$3BN in revenue in 2015. Partnering with a multi-billion-dollar giant is a very positive sign that TV2 has succeeded in its development of an effective product that is both technically robust, customer friendly and superior to other alternatives. Under the agreement, PGAS’ business customers will be able to on‐sell TV2 entertainment services including video-on‐demand, games, music and even karaoke. Revenue will be generated through a monthly subscription fee, pay‐per‐view and personalized advertising. The Indonesian group will also be able to bundle the TV2 entertainment offering with its existing gas, telephony and data services allowing PGAS to offer a “quadruple play” offering to its new and existing customers. Or in other words, TV2’s core product delivers an all-inclusive grand slam for both content providers and customers looking to take their TV viewing and digital content consumption to the next level. An additional bolt-on to TV2’s Indonesian venture is the first customer, SMARTFREN. The proof of concept has been completed successfully. SMARTFREN is a 4G mobile network provider looking to add and diversify content in its product line-up. TV2’s deal with Divan.TV represents the company’s Eastern European ambitions. The most important aspect for investors, and what could trigger a sudden re-rating of TV2’s valuation, is the fast tracking of service delivery to meet expected legislation changes with regards to piracy and illegal streaming in the Ukraine this year. This is likely to benefit the subscription uptake, just as TV2 is set to deliver the latest Hollywood content, as well as localised content and karaoke to Russia and the Ukraine. Through the Divan deal, TV2 will become one of only a handful of companies with rights to stream premium content in Eastern Europe . That’s a great party-piece for this fledgling ASX content provider to have at such an early stage of its growth. TV2’s Toomai deal involves integrating TV2’s IVAN-powered platform into NPBB GROUP’s operations thereby providing tailed insights about its customers, providing an overview of their demographics and location as well as their viewing habits including what content they are consuming, when, where and over what device. By the analysis of data, the partnership can turn data into insight, insight into intelligence, intelligence into action and actions into results, maintaining viewer engagement from the recommendation of content and entertainment to highly personalized targeted advertising. The karaoke market, particularly in Asia-Pacific, is a key media opportunity for TV2. According to TV2’s estimates, karaoke as a type of content offers the lowest capex and highest margin combination compared to all other types of content. TV2’s Karaoke2U App has now launched in the CIS, Malaysia, Thailand, UK, New Zealand and Australia. Furthermore, TV2 will be rolling out its K2U app in Indonesia as well as in Australia and New Zealand. Indonesia has been selected due to its population size and cultural similarities with Malaysia, where the App has already enjoyed a great uptake. After the initial soft launch, TV2 is now preparing for an official global online marketing campaign over the coming months to coincide with the major feature rich upgrade of K2U completed in September which includes Karaoke performance video publishing, sharing of content, chat and friends features, which will hopefully boost downloads, subscriber numbers and revenue. Regular fees agreed between TV2 and telco/content provider using TV2’s platform to maintain service and ongoing relationships. Content licensing fees depending on the type and level of copyright. Direct payments from users subscribing to content. The price of various content can range from zero up to a few dollars for latest movies and sports events streamed live. Fees for maintaining infrastructure at the point of sale including servers, staff, equipment, licensing etc. What if there was a company that embraced the online content surge, applied cutting-edge data analytics to its users and generated ads that people actually want to see? TV2 has developed a platform to do just that — IVAN. TV2 wants to take the inefficient status-quo and inject a bucket load of dynamism into proceedings. As an example, TV2’s platform would allow a broadcaster to stream content to viewers and be able to create detailed activity profiles across viewing habits, browsing activity, online shopping choices and even search terms they entered on their phone or laptop. Think Internet of Things but in an online entertainment niche. In a nutshell, TV2’s platform is a full spectrum content streaming and data analytics tool that can take online entertainment to the next level – for both consumers (more content available on more devices) and broadcasters (improved commerciality and better analytics). iVAN makes it possible for organisations to quickly and efficiently launch and deliver cost‐effective OTT video services while staying on budget. 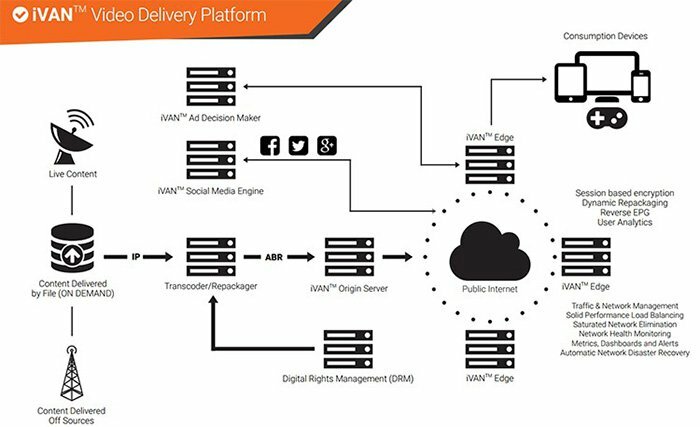 Device and network‐agnostic, iVAN enables content to be delivered anywhere, in any format, to any device across any network in a cost‐effective way with minimal latency issues. With iVAN, users receive a full spectrum content streaming and data analytics tool that taps into new revenue streams for online entertainment. For consumers, this means more content available on more devices, and for broadcasters and content providers, it means improved commerciality and better analytics. When investors put their hard-earned in a tech stock, they like to see if the spotlighted tech idea is winning plaudits from industry peers and/or users. With TV2, its proprietary IVAN technology was a finalist in the prestigious Managed Services World Congress Awards. The Innovation Award finalist honour is given to a company that best exemplifies innovation in technology, business change or operational transformation. TV2 was rubbing shoulders with other leading companies in the global digital arms race including Chinese mobile device company Huawei, NEC subsidiary Netcracker Technology, telecommunications powerhouses Vodafone and Nokia as shortlisted finalists. The next few months should be “newsflow-heavy” for TV2 given the multitude of commercial agreements signed over the past year. These agreements are due to generate TV2’s first substantial revenues since listing , and it could just be a matter of time until a share-price-boosting catalyst shows up on the horizon. However, any catalyst is speculation on our part at this stage and therefore investors should not only use the information in this article, but also all publicly available information to inform their investment decision, and seek professional financial advice. TV2 has completed its service delivery Proof of Concept trial for its Indonesian project in partnership with PT.PGAS, which is a major milestone for the company and will see PGAS pay US$3.5M to TV2 for the cost of service delivery and a monthly management fee per active customer. TV2 has also signed an MOU with two established Brazilian telcos to provide the technology platform for the delivery of OTT television to Brazil. Field trials have been completed and commercial terms will soon be finalised. Other deals that could provide catalysts in 2017 are a signed Heads of Agreement with Netherlands based health and fitness company Body Works International BV to launch the company’s first health and wellbeing OTT content initiative. This will start shortly. This is the type of commentary investors like to see from their early-stage picks and you can expect further newsflow from these deal in the near term. TV2 has admittedly taken a relatively difficult route to getting its IVAN-powered platform into the digital wild. Following some strategic tweaking after listing, TV2 is now fully focused on Brazil and Indonesia — as springboards into the broader commercial savannas of Latin America and Southeast Asia. These are two regions showing immensely strong per capita growth amidst bundles of spare capacity in terms of customer demand. Asian consumers are embracing the digital revolution in droves, so by offering a much more personalised media, gaming, TV, karaoke and social media experience, when compared to other platforms — all bundled and seamlessly cross-cloned across all devices — TV2 has every chance of meetings its commercial expectations. TV2 has formulated a clear strategy of maintaining a low capex model whilst generating opportunities within the sector that are usually only made available to major players in the industry. The main reason why this little bite-sized start-up is even considering challenging established billion-dollar players is its advanced technology and unique technical approach. It’s an approach that empowers its white-label clients to generate revenue from previously inconceivable sources – and infusing the whole process with an avalanche of useful analytics metadata that can be used to generate additional revenues. American juggernauts such as Apple, Google and Amazon may have cornered the Western world, but that doesn’t mean OTT and on-demand streaming are all sewn up in terms of market availability. Brewing a commercial cup of tea with a side of tracking cookies in hand, TV2 is one digital sprite we think could pop up on millions of screens over the coming months.